This can be made out of many different styles and types of wood. I used 3/4 “ ply. These can vary as well depending on what you have available. Assemble the top and bottom frames by using two 18 1/2” and two 17” boards attaching them with pocket holes and wood glue. I used corner clamps to ensure the frames were square. Assemble the Legs together out of the 29” boards. The 3” wide board is secured to the 3 3/4” wide board using pocket holes and wood glue. Attach the legs to the frames at each end. Secure using glue and construction screws. Attach the 20” x 20” Top work surface to the top of the frame. Attach the 18 1/2” x 18 1/2” shelf to the bottom frame. Attach Castors to bottom boards. Now you can place whatever tools needed on the cart and use as desired. Add a power strip to the side for easy use. Great to see more and more woodworkers appreciating the benefits of Sketchup. Personally, I prefer to sit and design with Sketchup at night rather than watch that idiot box for hours (40 minutes of commercials per hour of viewing… for us with free-to-air). It has saved my bacon countless times, especially when it comes to the “hidden” measurements in mortice & tenon and dovetail joins. Only thing I would suggest though is a drawer… After all one can’t have enough drawers… I have one even in my trackie-dacks. Well it’s a fairly small cart and the legs leave me only 14” to work with. Not sure how to make a drawer work. The only $$ I have in this is the screws and glue. All the lumber comes from a local cabinet shop dumpster. Only thing I would suggest though is a drawer… After all one can t have enough drawers… I have one even in my trackie-dacks. Well it s a fairly small cart and the legs leave me only 14” to work with…. Just kidding… In reality you’d probably add something during (or after) the actual build… even if to only hold a pencil and tape measure, however, seeing as how you went to the trouble of including the caster in the drawing… why not go full hog? ..... only $$ I have in this is the screws and glue. All the lumber comes from a local cabinet shop dumpster. You forgot the casters, petrol to the dumpster (unless it’s next door)! Please don’t take this as criticism, but rather the views of an old bloke that is sitting at his computer with time to spare due to tools down hours and crap on TV (and no Sketchup projects till my next set of T & J plans arrive in a couple of days). In all honesty it bemuses me when people try to cut costs. I have found that penny wise pound foolish was written by someone that watched me closely in the past. I am now older and wiser… well at least older. 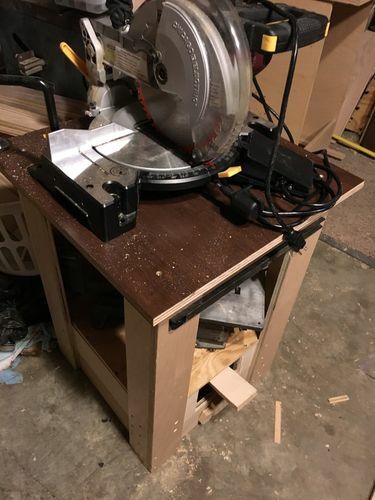 I don’t have access to “a local cabinet shop dumpster”. Many bloggers have touted “made from scraps”. I went to my local timber merchant and he didn’t sell “scraps”. So I am guessing that the “scraps” used had a cost to them originally. In my opinion, if one builds a project to sell and the customer pays for it all, any leftover (with permission to keep for free) can be considered “scrap”, however, if bought for one’s self, it is a costed component. I’m a retired hobbyist with no commercial (only what I’m fed on TV) involvement whatsoever so I get nothing for free. PS. If more woodworkers used Sketchup to design their project and then use cut lists to purchase the lumber.. their “scraps” box would be restricted to pieces that could only be used for clamping pads. So I added a full top to the cart, a magnetic strip across the front, and a switch with outlets on the side – Not shown in pics.